If you are planning a visit to Huntington Beach, there is no need to leave your pet behind. From pet friendly hotels in Huntington Beach to pet-friendly attractions, the quaint town of Huntington Beach is a place where pets are warmly welcomed. The Hyatt Regency accepts up to two pets with a combined weight of 75 pounds and provides comfortable pet beds along with food bowls. The Extended Stay of America allows pets up to 50 pounds and charges a $25 fee. Just keep in mind that if you leave the hotel without your pet, your pet is required to be crated, so be sure to bring along a crate. The Shorebreak Hotel serves up some serious pet love with its Pet Welcome package filled with toys and treats. As additional perks, there is no weight limitation, and pets stay for free. The Waterfront Beach Resort is another favorite. This hotels absolutely loves pets…so much so, that it has an electric shuttle to and from the nearby famous Huntington Dog Beach. Visit our Huntington Beach Travel Guide for everything that is pet friendly. Along with plenty of pet friendly hotels in Huntington Beach, you can enjoy some outdoor fun with your pet. It is definitely doggie heaven at Huntington Dog Beach. Dogs can play in the sand and splash in the cool surf. For a leisurely stroll, the Santa Ana River Trail is ideal. Visitors are allowed to bring leashed pets, and the conservancy provides free maps for a guide. The Best Friends Dog Park has separate areas for large and small dogs along with doggie water fountains and shaded benches. If you go at the right time of you, you will find there are plenty of activities that include pets. For one, there is the Surf Dog Competition where you will see Peter Noll with SoCal Surf Dogs, give the dogs a chance to compete in the waves. 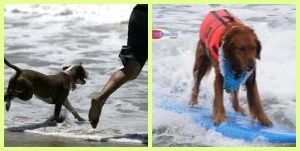 These surf dogs are fun to watch and definitely make for an entertaining day when the competitions are happening. For dining out, there are many pet-friendly restaurants to grab some grub with your four-legged friend. The Park Bench Cafe is a cute; offers outdoor patio areas for pets, and full pet menu is provided. For a quick bite to eat, pull up to the In-N-Out. This fast food establishment will even cook up a hamburger patty for your pooch at a rock-bottom price of 70 cents. There are also outside tables where you can dig in right along with your pet. The Sit Stay Cafe offers casual dining, and pets are welcome on the patio. It is also just a block away from the popular Huntington Dog Beach. With so many pet friendly hotels and pet friendly activities, shopping, attractions and other fun stuff to do in Huntington Beach, this surf city is idyllic for both pet owners and pets.